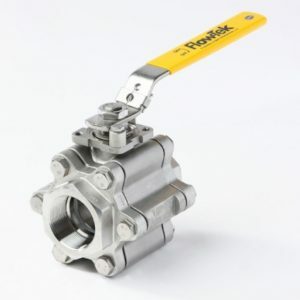 Flow-Tek’s Triad Series valves are known to be one of the strongest, most robust three piece ball valves in the industry. With advanced seat and seal materials, the Triad rating can be extended to handle service pressures to 5000 psi and a temperature 550°F. Triad HP valves feature PEEK seats. Flow-Tek’s PEEK material is a blend of polyether ether ketone, a highly engineered thermoplastic, with carbon and graphite. PEEK offers excellent abrasion and corrosion resistance under continuous exposure to high pressure and high temperature. All features of the standard Triad Series are present in the Triad HP design including a heavy robust center section tapped for full hex head cap screws, live loaded stem packing, redundant body seals, anti-static protection and locking safety handles. As with most Flow-Tek valve designs, the Triad HP comes standard with an integrally cast top flange designed for ease of actuator mounting. The Secure Mount provides positive mounting, eliminating unwanted actuator movement during high cycle or continuous duty applications. 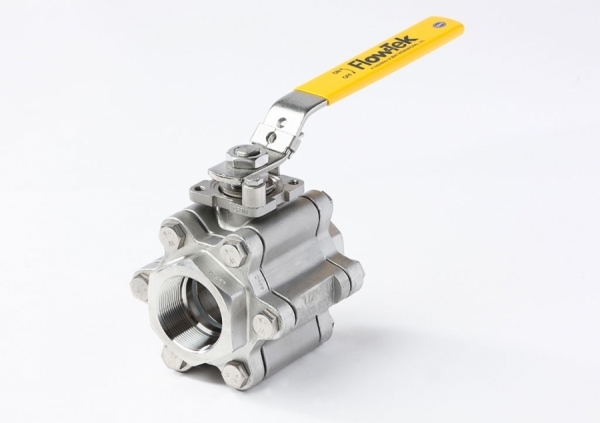 Actuators and other accessories can be easily and safely removed while the valve is under full line pressure.